If you have harnesses, your back will be pushed firmly into the backrest- so when adjusting your seat, make sure you use this position as reference. 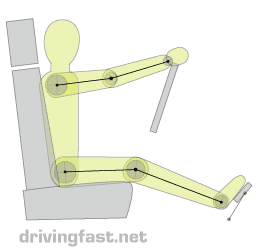 Let’s start with the arms – you should be able to comfortably rest your wrists on the top of the steering wheel without leaning forward (Diagram 1). 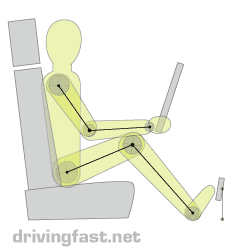 Your hands should have freedom of movement around the entire wheel (not just the top half) and if your hands touch your knees at any point (Diagram 2) or if your elbow hits the door, consider investing in a smaller wheel. 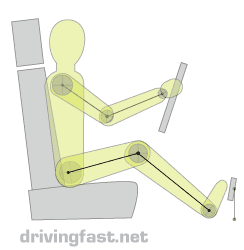 Your default steering position should be at the ‘quarter to three’ position so ensure the steering wheel is adjusted to allow maximum comfort (Diagram 3). Note: If you’re using harnesses, once you’re bolted into your seat it’s unlikely you’ll be able to reach as far as usual so make sure you adjust your mirrors and any other gadgets before-hand. Legs are easier to get right than the arms. The rule of thumb is to sit in a position which allows you to fully press the clutch and accelerator to the floor while maintaining a slight bend in your knee. The brake usually moves less then the other pedals so is less important in this respect. 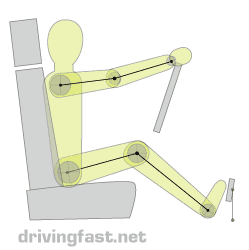 Make sure that your knees aren’t making contact with the steering wheel, and mimic a complete revolution of the steering to ensure freedom of movement. When driving on the track, most drivers adopt a more upright seat position than when on the road. This ensures proximity to the wheel and good visibility, which can lead to better control than a more relaxed position. If you’re tall or usually have your seat set high, headroom can be an issue when wearing a helmet. An inch or two of clearance is a must – banging your helmet repeatedly on the roof or on roll bars can cause damage. Everything else is a matter of comfort – remember that the priority should be to create an environment where you have maximum control over the wheel and pedals, and good freedom of movement.